Elton Stevens Obituary - Watervliet, New York | Parker Bros. Memorial Funeral Home Inc.
BERLIN – Elton Frederick Stevens, 73, died Saturday evening, August 12, 2017 at Samaritan Hospital in Troy. Born in Berlin on September 15, 1943, he was the son of the late Harold and Margaret Gray Stevens. A lifelong resident of Berlin, Elton was a US Army veteran of the Vietnam War serving from 1967-69 with the First 32nd Armored Battalion. Elton owned and operated several bar and restaurants including the Berlin Pizza House, Valley Tavern and the Brookside Restaurant before retiring. He was the former Fire Chief for the Berlin Volunteer Fire Department and was a member of the Taconic Valley American Legion Post #937. 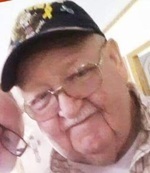 He enjoyed camping, antiques, tag sales, going out to eat, NASCAR and spending time with his grandchildren. He was the beloved partner for 25 years of Judith Perham; devoted father of Randy S. (Earline) Stevens of Ft. Edward, Kevin E. (Theresa) Stevens of Berlin and Laurie A. Stevens-Woodcock of East Greenbush; step-father of Eric (Jeaneatte) Alderman of Berlin and Tammy Perham of Stephentown; brother of Goldy Lohnes, Edna Stevens, Mary Higgins, Ike Stevens, Jesse Stevens and the late Dorothy Clyde, Arthur Stevens, Charles Stevens and Shirley Flavin. He is also survived by the mother of his children, Beverly Weber of Berlin and 13 grandchildren, 14 great grandchildren and several nieces and nephews. Relatives and friends may call at the Thomas M. Barber Funeral Home, 66 Armsby Road, Petersburgh on Wednesday from 4-7 pm with a wake service and Berlin Fire Dept. honors at 6:30 pm. His ashes will be interred on Friday at 11 am at the Berlin Community Cemetery where military honors will be accorded. In lieu of flowers, contributions may be made to the Taconic Valley American Legion Post #937, PO Box 472, Berlin, NY 12022.